He complained about his own appointees, again. Most of Trump's attention today was on golf—either his 182nd trip to the links since taking office on a promise not to play, or on Tiger Woods' victory at the Masters. 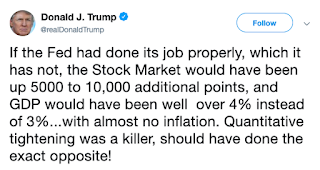 But he found time for one job-related action: complaining about the Federal Reserve. There's not much reason to think that Trump understands what the nation's central bank does. For that matter, there's no reason to think he understands whether what it's doing is different from what he supposedly wants it to do. The federal government now expects the economy to slow considerably in the coming years, something Trump cannot afford politically after taking credit for a post-recession recovery that began in 2009. But thanks to unexpected vacancies, the current Fed board is almost entirely Trump's creation anyway. Trump has appointed all but one member of the Fed's Board of Governors, and is trying to fill two further vacancies—although he's having a lot of trouble finding qualified candidates who are willing to do as he asks. 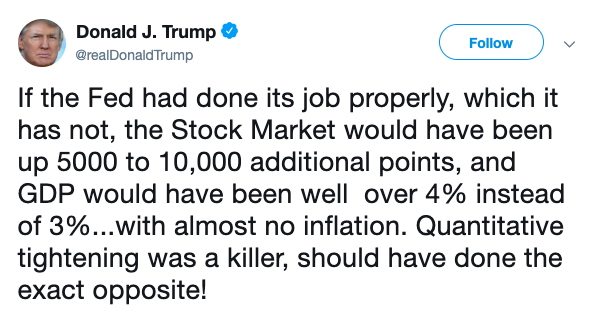 The President of the United States absolutely has to have basic economic literacy. Presidents are responsible for the actions of the people they appoint—even if they're confused about when they should be trying to duck that responsibility.